Google Analytics and Mixpanel both are known as the most powerful web and mobile analytics tools. The difference between both the tools can be mainly described in terms of tracking method, price, data processing time and funnel analysis. The major difference that makes Mixpanel different from Google Analytics is the tracking method. Mixpanel is focused on event tracking while Google Analytics core feature is based on page views. Mixpanel vs Google Analytics: What to opt for and When? The major difference between Google Analytics and Mixpanel is the method both tools use for tracking visitors. For most companies, real time reporting holds a huge impact on overall business performance. Unfortunately, many of these industries are still unaware of their hidden strengths. Google Analytics real time reports tend to get updated quickly for smaller websites but for larger ones the data processing takes more time than usual. We can say that Google Analytics real time reports lag and takes upto 24 hours to process the entire data. Mixpanel, has the ability to update data within seconds. It is comparatively faster than Google Analytics when it comes to data processing in real time. 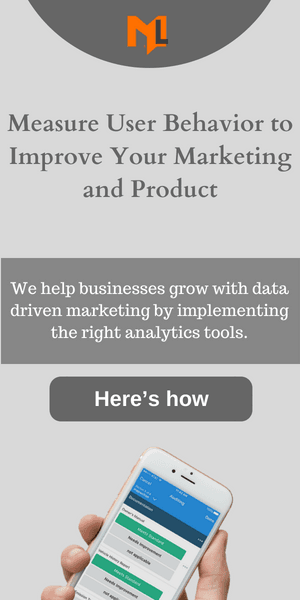 You would be amazed to see how real time data is changing business optimization. Funnel is a best way to visually measure how visitors/users move through a series of events/pageviews. Mixpanel provides excellent funnel analysis which Google Analytics can’t. With Mixpanel creating a funnel is easier than ever and only requires a few simple steps. Simply choose the events in sequence. They are retroactive, meaning you have the flexibility to measure different paths based on your historical data and see how fast people convert. Google Analytics doesn’t provide any such functionality but it does allow you to create funnels for any page which needs deep understanding. Many industries tend to track users instead of just limiting themselves to pageviews and events. This gives them a deeper understanding of how they can monitor a user and how they move through the conversion funnel to end up a happy customer. To determine a unique user, Google Analytics uses the browser cookies to store a unique client id. This is limited to the users visiting from a single browser and fails to track the same user across multiple devices. To get this done, you would need to setup cross device tracking by assigning a unique user id, for which you might need to rely on a developer. While Mixpanel gives you the ability to track individual users instead of relying on cookies. With people analytics, you are all set to create customizable profiles, search for a specific user from the list or just create your own custom profiles. The most exciting feature is the activity feed which enables you to find out how people use your product. Event tracking refers to measuring actions people take on your website or product. By tracking user actions you can update your product and see which features or actions users most take. As stated earlier that Mixpanel is even more event centric and let’s you track any user action in your app while Google Analytics tends to be more focused on measuring pageviews. In fact you can easily track customer’s actions by writing custom codes and send them as events to Google Analytics. In a nutshell, tracking user actions is more easier in Mixpanel as compared to Google Analytics. Mixpanel provides the best method for retention analysis which helps measure the behavior of new users. Whether or not they come back to use the app and how frequently they use it. While Google Analytics does provide the cohort analysis method but is not a core functionality and the feature is still in beta. But for small businesses it provides enough Insight to help in decision making. Both Mixpanel and Google Analytics provide A/B testing techniques but the difference is Mixpanel only provides mobile A/B testing while Google Analytics provides web A/B testing. We can say that Mixpanel A/B testing is pretty straight and very easy specially for developers while A/B testing in GA does require some hacks to go through. Mixpanel provides a simple practice to create segments by breaking an event apart by its properties and create graphs of the reports. Google Analytics does the same but it requires more steps to undergo the process. Mixpanel provides a manual way to set incremental properties for keeping record of customers showing more interest in your product. In Google Analytics there is no such feature for setting incremental properties however you can use advanced segments to count customers who have purchased more than a certain number of times. With Mixpanel, you can get in touch with your customers on the go based on the actions they take. With automatically triggered emails and push notifications you can persuade your customers use your app again and hence improve overall activity. Google Analytics doesn’t provide features to get in touch with your customers in any way. Mixpanel has excellent customer support and provides real assistance every step of the way. That is,from setting up the first account to understanding and using reports. In case of Google Analytics, nobody from Google will provide support unless you have Google Analytics 360 suite. But the thing that stands out in Google Analytics is the active community groups where you can get an instant help from top analytics experts. You can say Google Analytics has the edge here over Mixpanel because of a larger number of users which contributes to highly solution oriented community groups. It would be difficult to consider a single tool to be a winner. Each tool has leverage over the other in some way. But we can conclude that for focusing on customer actions and real-time interactions in larger business areas, Mixpanel would be your go-to tool but for relatively small/medium businesses, Google Analytics would be the ultimate choice. If you are considering Mixpanel for your business, make sure to keep Google Analytics in the loop as well because it comes with multiple features that its contender somewhat lacks and can provide ample amount of data for processing. Finally, if you are looking for an expert to implement Mixpanel or Google Analytics on your site, check our saas analytics services.